Hull City manager Steve Bruce believes Arsenal's nine-year wait for a trophy means that all the pressure will be on Arsene Wenger's side in the FA Cup final meeting of the two teams. Hull beat League One Sheffield United 5-3 in Sunday's semi-final. Arsenal, who beat Wigan on penalties on Saturday, have not won a trophy since they last lifted the FA Cup in 2005. "The pressure will be on Arsenal because they have not won anything for a while," said Bruce. "They are a great side, they have great tradition and great history with a top-class manager. We are up against it but we will do our best." A place in the 17 May final looked unlikely after a poor first-half performance by Hull, who were second best to United in all areas. Nigel Clough's side deservedly led at the break thanks to goals from Jose Baxter and Stefan Scougall either side of a Yannick Sagbo strike. However, Hull were much improved after the restart, with the introduction of Matt Fryatt and Stephen Quinn proving crucial. Both men scored - as did Tom Huddlestone - and although Jamie Murphy's stoppage-time goal threatened a late fightback, David Meyler put the game beyond the Blades. The second-half transformation suggested Bruce's tactical changes made the difference, but the manager instead credited his captain Curtis Davies with an inspiring half-time team talk. Steve Bruce won the FA Cup as a player in 1990, 1994 and 1996 and will now manage in a final for the first time. "The captain said it all. He took over and I had a cup of tea," said Bruce. "He is a proper captain and they are a dying breed these days. "I have to take responsibility for the first half; we needed to change. We were awful in the first half but credit to Sheffield United, they are a League One team and handled us well." It is the first time in Hull's history that they have reached the FA Cup final and continues what has been a successful couple of years for Bruce at the club. After his appointment in the summer of 2012, he led them to promotion back to the Premier League in his first season and is now close to retaining their top-flight status. 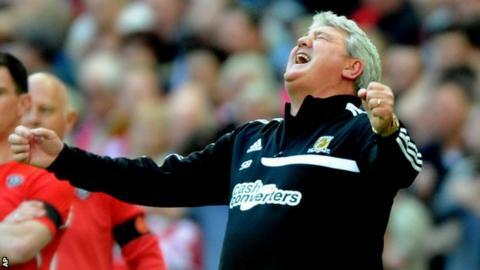 "I have had a great couple of years at Hull," said Bruce. "It could not have gone any better for us. "The club gave me the chance to get back into management and the biggest compliment they can pay me is that they let me manage. They deserve a pat on the back because I do not get any interference from the people who employ me. "For them and the supporters I am delighted."